South America is a continent of extremes when it comes to water. Most of the world’s largest rivers (especially by volume of water) are within South America. The density of waterways is unrivalled on the planet. With this abundance of water, it comes as no surprise that many of the world’s greatest waterfalls are within South America. So which are the best waterfalls and how do you get to them? Iguacu, Iguassu or Iguazu. However you say it, it’s arguably the world’s biggest waterfall. There are numerous ways to compare the world’s waterfalls – Iguacu isn’t the highest or even the widest, but it is the waterfall with the highest volume. Victoria Falls in Africa is the only waterfall that even comes close to Iguacu. In fact the Iguacu is really a series of falls, spanning hundreds of meters and over numerous tiers. On the Argentinean side of the falls it’s possible to take a walkway through and around the waterfalls. To give you an idea of the scale of the falls, it takes almost half a day to walk around them all. There is even a cantilevered walkway over the “Devil’s Throat”, the most voluminous section of the falls. To walk over the Devil’s Throat is an up close experience of nature’s raw power. The Brazilian side of the falls doesn’t allow you to get as intimately involved in the falls but it does offer a breath taking overview of the entire falls and all its levels. This is the perfect location for the postcard photo of the falls. Iguacu Falls is undoubtedly the easiest waterfall to visit on this list. 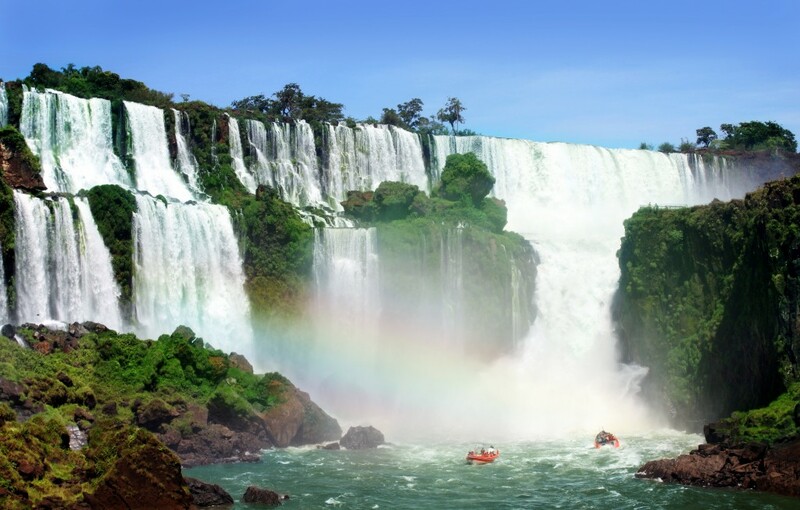 There are daily flights to the falls from Buenos Aires in Argentina and Sao Paulo and Rio de Janeiro in Brazil. The world’s highest waterfall, as no doubt everyone learnt in primary school. The falls are part of Canaima National Park, which is an amazing park in its own right. For example the dramatic tabular mountains of Tepuis, Roraima and Kukenan are only a short distance from Angel Falls, and worth visiting while you’re there. 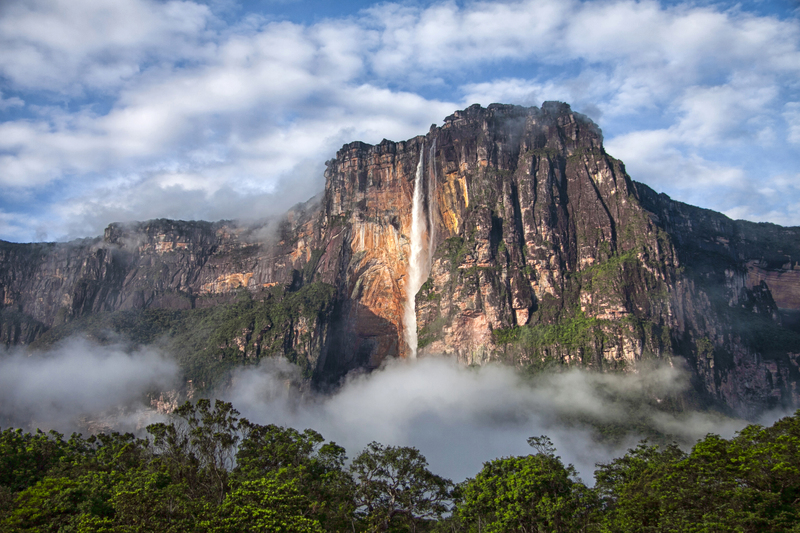 Unfortunately, unlike Iguacu Falls, Angel Falls is actually reasonably difficult to access. It is very difficult to walk there (unless you are prepared for a week or longer of trekking) and so for most people the best option for viewing the falls is to take a 40 minute flight over the falls, from the nearby Canaima Airport. Venezuela’s precarious political situation doesn’t help either. Much like Cuba to its north, it is not a capitalist society and as such things don’t always go as smoothly as we’d expect in the west. Be aware flights often don’t depart due to weather and/or minimum numbers being met for the day’s flight. It’s recommended that you allow 2-3 days just in case you don’t get to fly on your first day. On the eastern slopes of the Ecuadorian Amazon is San Rafael Falls, the largest of Ecuador’s waterfalls and arguably its most dramatic. It is near El Chaco, a small town which unlike many other areas in the Amazon is actually accessible by road from Quito. The falls are near Reventador volcano and the scenery along the walk to the falls is also quite stunning. The falls are approximately a six hour drive from Quito so you need at least 2-3 days from Quito to visit the falls. This is probably a waterfall you’ve never heard of but it’s also a contender for the world’s largest waterfall. That’s because it’s the world’s largest single drop waterfall at twice the height of Victoria Falls and four times the height of Niagara Falls. The name of the falls is also interesting as it’s named after a tribal chief who supposedly saved his people by sacrificing himself over the falls. 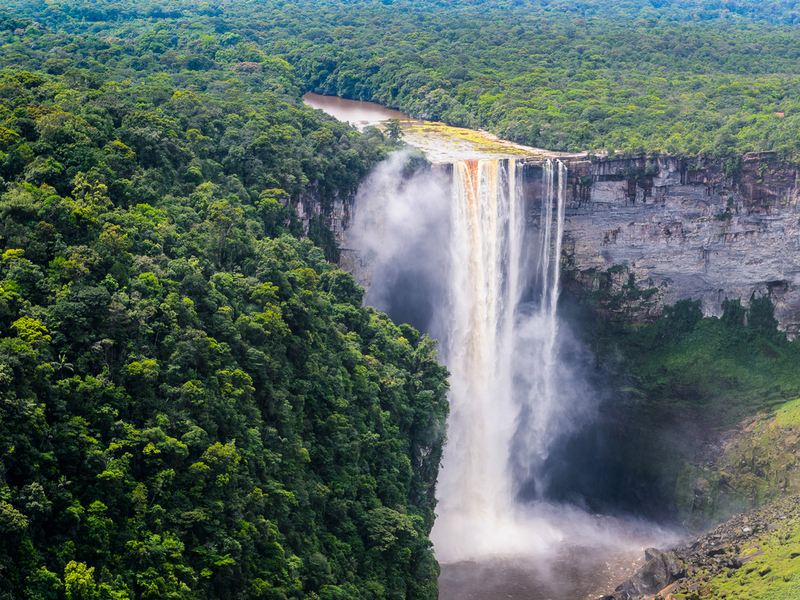 The falls are in a remote area of Guyana and it was only first seen by Europeans in 1870. 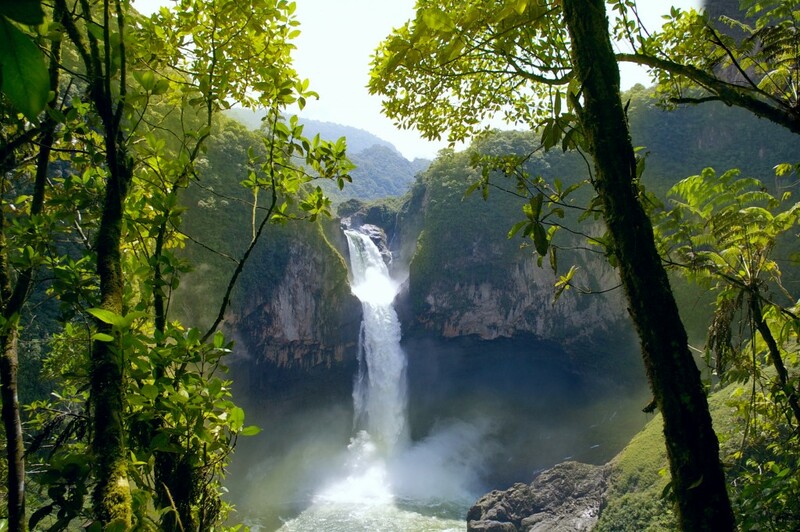 Kaieteur Falls can be visited on a small aircraft as a day trip from Georgetown, Guyana’s capital. This waterfall probably wouldn’t make this list in its own right, but it does have the fortune of being directly in from of one of the world’s most dramatic landscapes – Torres del Paine. Within Torres del Paine National Park is an interconnected series of lakes, each of varying colours and surprisingly differing pH. The pH levels in some lakes are so acidic that they are too acidic to swim in. The lakes and their varying colours and characteristics are part of what makes Torres del Paine so special. And so Salto Grande waterfall is essentially the overflow of Nordenskjöld Lake into Pehoe Lake, a point that co-incidentally is also the best point in the National Park to view the three famous Towers (or “Torres”) but also the equally stunning blackened granite horns (Cuernos del Paine). 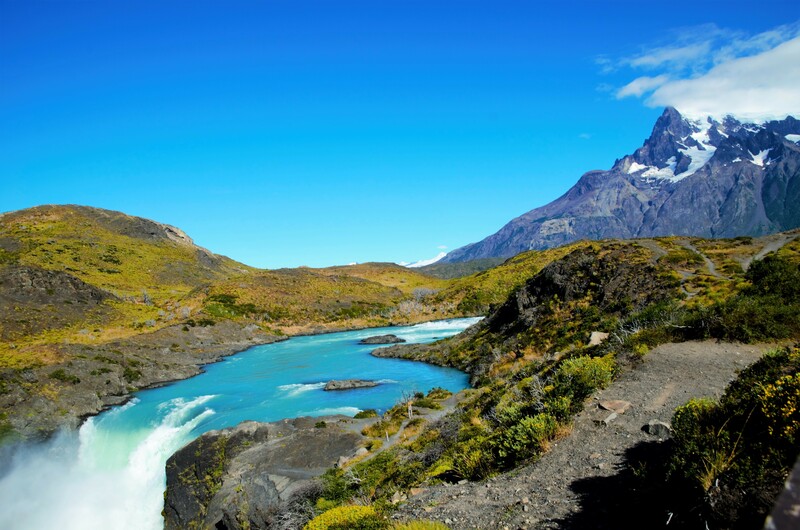 Torres del Paine can easily be reached from the Chilean towns of Punta Arenas and Puerto Natales, both have domestic flights from Chile’s capital, Santiago. The National Park can also be accessed from El Calafate in Argentina, although via a slower route over the Andes. Chimu Adventures offers trips to those stunning waterfalls, for more information and inspiration, click here.